One of the things I love about summer is all of the amazing produce that’s available. Fresh, sweet fruit, and those veggies that are just perfect are spilling out all over. Right now, two things that I love are in season – watermelon and blackberries. I also love a really good salad, one with lots and lots of goodies in it. 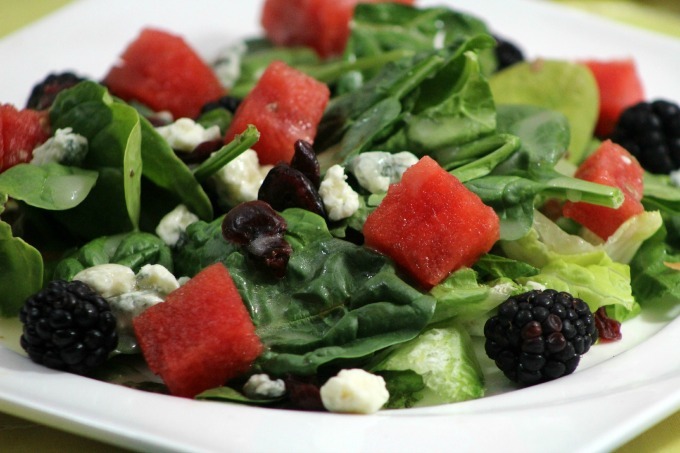 This Watermelon and Blackberry salad really fills the bill. 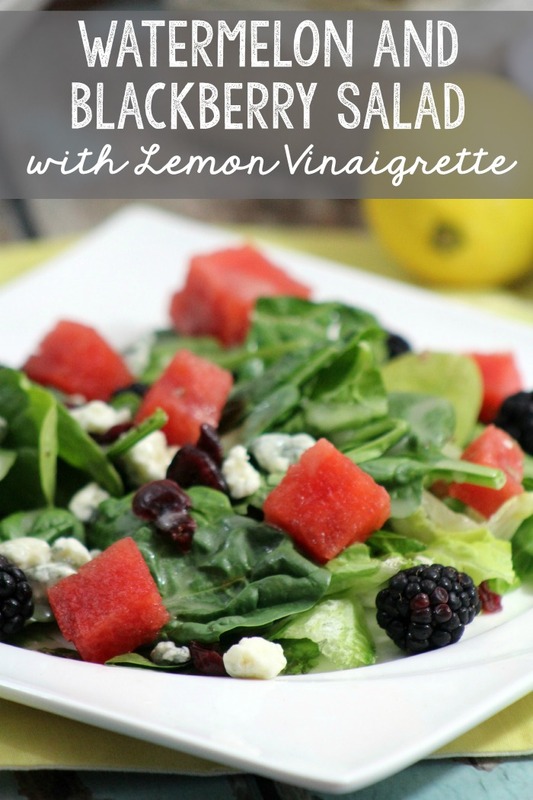 Add in a great gorgonzola and a tangy lemon vinaigrette? I am SO THERE! Rinse off the fresh spinach and dry it off with a kitchen towel or paper towels. Place the spinach and salad mix in a large salad bowl. Add the cubed watermelon and blackberries. Add dried cranberries and Blue cheese crumbles. Toss the salad ingredients together. Squeeze the juice of 2 lemons and 1 lime into a large glass measuring cup. Add olive oil and stir well. Add white wine vinegar, and whisk to combine well. Pour into a bottle with a lid. Shake well before using. Drizzle Lemon Vinaigrette over the salad and toss well. Add a protein like grilled chicken, shrimp, or salmon if desired. Makes 4 dinner sized servings or 6-8 appetizer servings.